Last weekend, two of my favourite little lovebirds decided to get hitched. So, to celebrate, I did a tribute mani. You know, because that's how I mark important events. No, I'm not kidding. That's really what I do. Haha! There's a chance I got carried away so I'm going to do things a little differently and show you a picture of the finished product first before going through the steps. As you can see, it ended up being a bit of an ambitious design, so bear with me while I break it down for you. To start, I did a gradient with Blu, Snowcone, and Margritte's Masterpiece. To watch my gradient tutorial, click here. When that was dry, I drew a thin line with the long striping brush and You Don't Know Jacques!, trying to keep it as straight as possible. Please note that this didn't really happen. Haha! But that's why I started with a thin line, because I knew I wouldn't be able to do it on the first try. Gradually, I increased the thickness of the line and when I thought it was wide/straight enough, I painted the additional branches for leaves and used the medium detail brush with Mackenzie to make the leaves. Next up were the birds. With the medium dotting tool, I used Tart-y For The Party and Charged up, starting with the bottom dot and gently swirling the tool in a circle to make a wider dot. I didn't want to use a larger dotting tool because my very round nail beds don't make for an even circle that way. 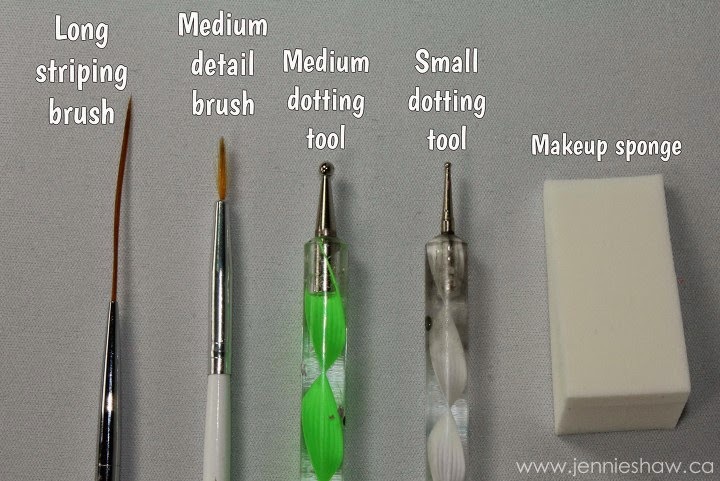 (If you have flatter nails, you could totally use a larger dotting tool and just "dot" instead of "swirl.") For the top of the bird, I did another, slightly smaller dot, also with the medium dotting tool and a bit of swirling. Then, I used a small dotting tool with Sun Worshiper to make the beaks and Black Expressionism for the eyes. 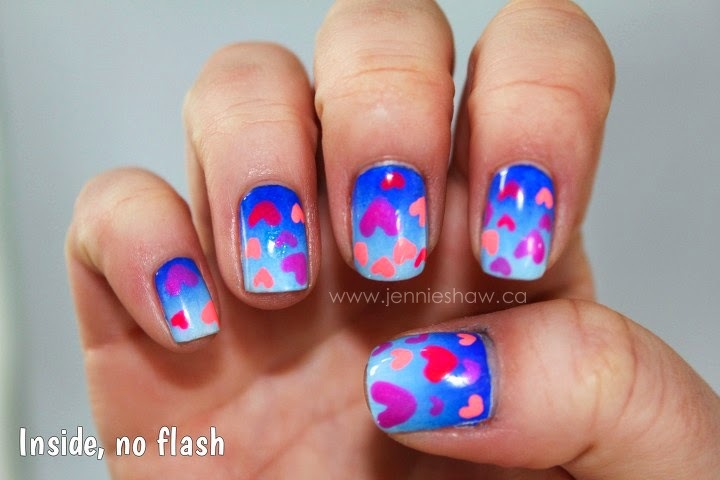 I waited until the very end to do the hearts, and used the medium dotting tool and Pool Party. For my thumb, I used You Don't Know Jacques and the medium detail brush to write the initials. To add some dimension, I opted to use three different pinks for the hearts: Pool Party, Flip Flop Fantasy, and La Vida Loca, and both the medium and the small dotting tool. And yes, because I know you're just dying to know (or maybe not, haha) I did my other hand as well. BUT because I'm not a glutton for punishment, I only did hearts, randomly placed and randomly sized with the same colours and technique as my thumb feature. 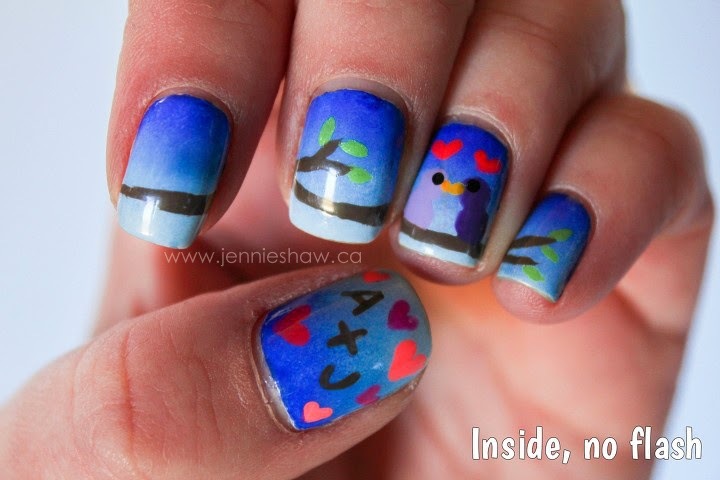 So there you have it: my little lovebird tribute mani. It was a very labour intensive mani that took a while but I just HAD to do it because I'm so EXCITED! HAPPY ENGAGEMENT, A and J!! I hope you all have an amazing weekend filled with springtime weather! And make sure to link up and make the rounds! There's pretty manis to be seen! 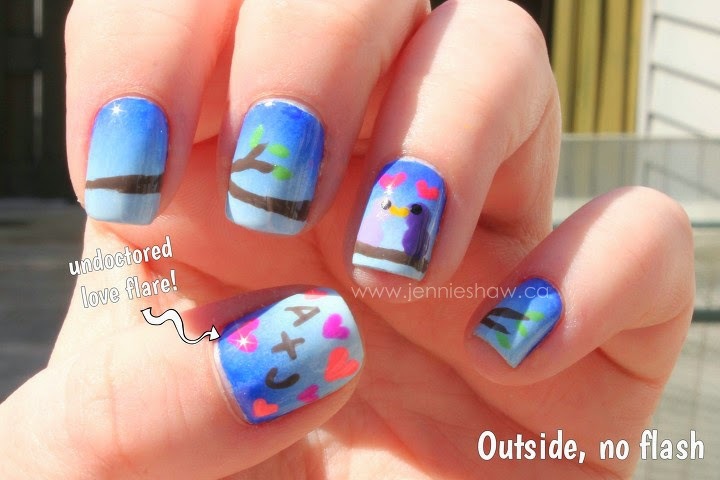 you always do awesome nail art. My nails are naked right now. Due to i'm going to be doing yard work soon. Good lord woman! This is awesome! And congrats to a&j! Aw, congrats to the lovebirds, and well done you! It looks fantastic and flawless, and must've taken hours. You're an inspiration! Wow, this is so cute. I love the colors together. Ah, that's sweet :-) Love the gradient blue background. Studies show that 100% of Baileys CAN'T EVEN HANDLE THIS MANI RIGHT NOW. I LOVE EVERY SINGLE MILLIMETER OF THIS. The sky blue gradient is ZEE BOMB, your birds are adorable, your little branch with birds reminds me of Woodstock, the hearts are precious, and the initials are PERFECT. You just one-upped everyone in the world Jennie. EVERYONE. Ugh you're such a show off...LOL! Seriously these look so freakin cute!! !